Tiffany Haddish is the hottest thing in comedy at the moment. So what do you do? Team her up with a solid gold professional like Kevin Hart and give them a movie together. Sounds like it works on paper, right? Well, we have the first trailer for their new movie together, and it looks like a sure fire winner for this fall. Night School is taking these two knuckleheads back to class. Universal Pictures has released the first trailer and poster for this hilarious looking throwback to when comedy movies were actually funny. It's a little bit Moving Violations mixed with Summer School and Police Academy. And it might just be what we, as a nation, need right now. Don't believe me? Just watch. Star Kevin Hart and producer Will Packer, who partnered for the hit Ride Along and Think Like a Man series, bring their signature style to Night School. The comedy from director Malcolm D. Lee (Girls Trip) follows a group of misfits who are forced to attend adult classes in the long shot chance they'll pass the GED exam. That premise has 80s written all over it. But with a modern twist. 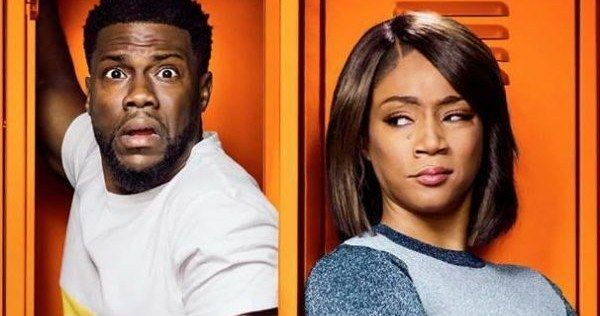 Not only has Kevin Hart aligned himself with Tiffany Haddish in a means to stay fresh and relevant after his big Jumanji win this past December at the box office, he's also assembled an amazing roster of funny guys and gals that include the always reliable Rob Riggle, former SNL Not Ready for Prime Time (or any other time) Player Taran Killam and some dude named Romany Malco. They join Hart on-screen for the film that Hart produces for his Hartbeat Productions, and Packer via his Will Packer Productions. Kevin Hart has been a non-stop powerhouse at the box office since his breakout role in Think Like a Man back in 2012. He's had some of the top drawing big screen comedy concert movies of all time, and has had massive hits like Get Hard, Ride Along and Ride Along 2, Central Intelligence, and The Secret Life of Pets. But no one expected Jumanji: Welcome to the Jungle to be the phenomenon it was. That's all well and good, but the real break out story here is Tiffany Haddish, who stole the show in Girls Trip. And she's been riding high ever since. She's been making a name for herself in bit roles on the big screen and small alike, but now she is ready to enter the stratosphere with her first lead in a comedy and it looks like the perfect vehicle for her to get behind the wheel of. There are some truly funny and inspired bits in the first trailer for Night School, and we bet it sweeps up at the box office this September. You can check out the first trailer for Night School here courtesy of Universal Pictures. We also have the poster for you to gaze upon. This could be the hit comedy everyones been waiting for.